Melissa Gonzalez truly grasps the concept of networking and business in New York City and beyond. Once a top executive on a Wall Street trading floor, she is now a force in the lifestyle world helping build the brand recognition of up-and-coming designers in fashion and beauty. Melissa is a true advocate of collaboration. She was recently nominated as one of “The Top 20 Most Inspiring Individuals in New York” and as one of America’s Top 100 Young CEO’s and is taking part in a major initiative towards being a voice for the future of start ups in the US. As a voice for emerging brands and trends, she is also founder of Lion’esque Style, a cutting edge e-commerce platform for emerging brands. 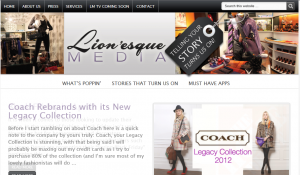 Lion’esque Style is an e-commerce solution for emerging brands, a discovery destination for fashion forward shoppers. Each week we launch a new brand, we share their inspirations, design process and give our followers insight to the designer as well as the collection. We also provide trend insights – the new “must have” color, pattern, style. “Don’t Ask.. Be Asked” is one of our slogans. MO: How have you gone from being a top executive on a Wall Street trading floor to running two lifestyle influenced businesses? What did your turning point look like? Melissa: The transition has been an interesting and creative ride. From Wall Street I gained experience on pitching stories and really understanding business models that work. While on Wall Street, I also hosted a T.V. show for 3 seasons called Latin Beat. As a host I developed a unique skill set for story telling. When I left Wall Street my desire was to create a marriage of both worlds. From my webseries concept Homemade BFF’s to Pop-Up shops to E-commerce, I would say our launch of e-commerce has been the turning point of leveragability for being a voice for emerging brands. MO: What was the biggest challenge from going from Wall Street to becoming a self-funded entrepreneur? How were you able to apply the experience you gained on the trading floor to opening your own business? Melissa: It’s been a solid learning curve! Lion’esque Media is self funded and Lion’esque Style has some early investors. When laying the ground work for my business plans I reflected back on the company pitches I sat in on for road show presentations. “What are the necessary fixed costs, what were areas I need to invest in to differentiate us and where does the model have leverage to scale.” It’s a constant balancing act when you are a start up company. MO: Congratulations on being recently nominated as one of “The Top 20 Most Inspiring Individuals in New York.” Why do you think that you were chosen? How does it feel to be an inspiration and leader to others? Melissa: I am told I was chosen by nomination, and that is a huge compliment. My mission with Lion’esque has always been to be a voice and grow awareness of emerging brands. I believe having a mission beyond ourselves it what inspires others. MO: Who or what inspires you? Have you had any mentors during the course of your career? Melissa: My lifetime inspiration is my mom. During my career I have also been fortunate to have leaders in different realms to serve as mentors, whether in wall street or in my entrepreneurial path. Currently I have an advisory board of amazing mentors for Lion’esque Style ranging in specialty from fashion merchandising to logistics to consumer marketing to finance. MO: How will Lionesque Style change the game for emerging brands online? Melissa: We give brands the opportunity to really “show up” online. We focus on actually growing the brands’ names. You can think of us as a PR company that’s providing an e-commerce platform. We’ll do all the photos, the video, and editorial copy. We also introduce the brands to press – whether it be through celebrity placements or inclusion in televised fashion segments. The mission is to allow the designers to design, manage their inventory, and ship it. We’ll do the rest! MO: Running an ecommerce site is not always easy. What advice would you give someone wanting to start an online business? What are the advantages of using the pop up shop platform? Melissa: Do your research and understand that online is as hard as having a physical store. Understand your niche, be sure to build an SEO friendly platform, invest in quality content (whether it be photos, video or editorial copy) and understand that the online consumer will only be enticed to visit again if there is a constant feel of fresh content on the site. With a pop up shop platform content will presumably be fresh, but with that also comes the responsibility of creating on a constant basis.